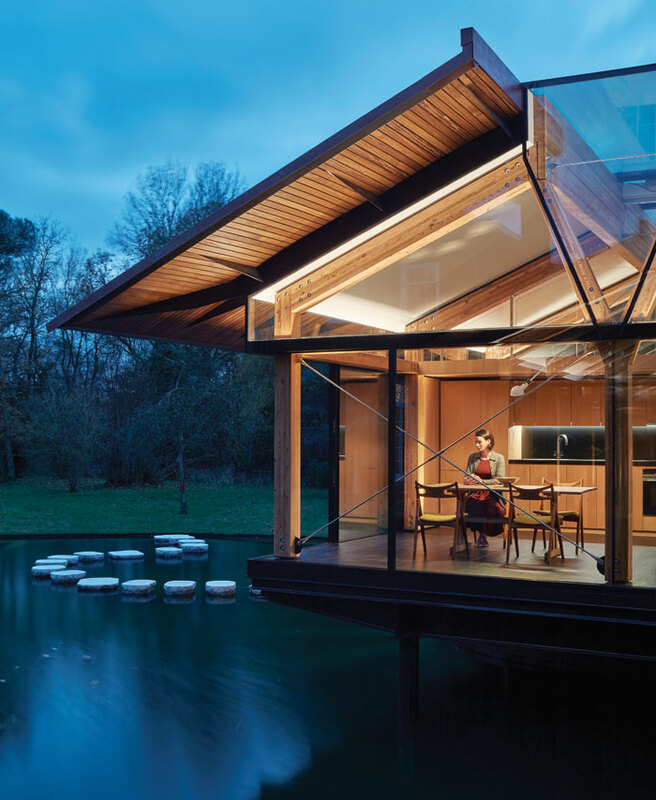 With the lightness of an origami construction, Stepping Stone House perches over its watery setting, harnessing the immersive qualities of the surroundings: trees, ferns, lake, lawns, fountains, and the shifting patterns of sunlight and shadow as they play across the water and its interiors. 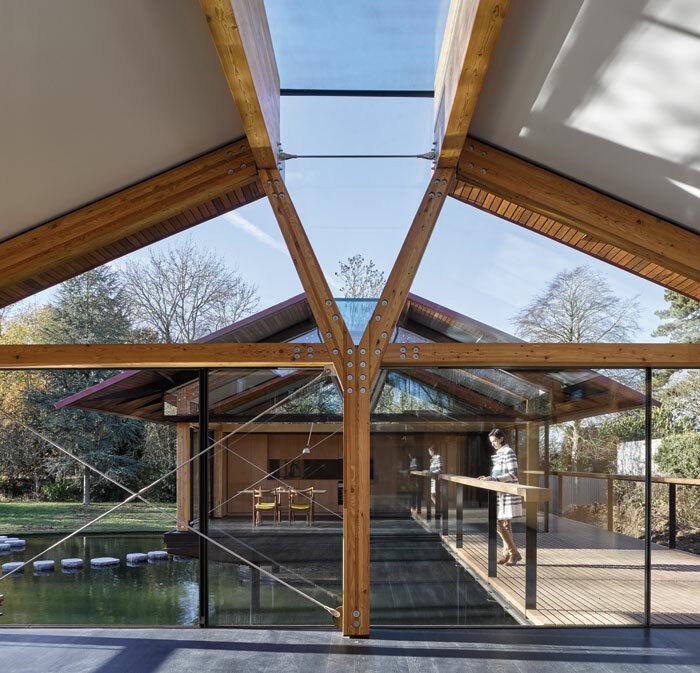 The two adjoining structures seem composed of the simplest elements: diamond-tiled overhanging roofs, perched on a steel base, with timber glulam frame, timber floors, and walls of either sheer glass or brick. But achieving this level of simplicity, and to this standard, has been a massive labour of love and ingenuity for architects Hamish Herford and Nick Lyons, of London and Tewkesbury-based practice Hamish & Lyons. It has been a massive commitment (financially and emotionally) for the client too: a hotelier and his wife, who wanted to expand the bedrooms and play spaces beyond their main house in Berkshire, to give greater vent to the energies of their five boisterous sons. ‘They wanted to get the kids away from their iPads and into nature,’ says Herford. ‘Our brief was to refurbish the garden studio for £100,000. We came back with three options — the £100,000 one, the £300,000 and the £800,000.’ By a stroke of luck, the client was late for the meeting, so Herford and Lyons pitched the scheme to the kids, who voted unanimously for the most expensive, multisensory, option. ‘They loved it,’ he says. Five years and £2m later, they have so much more than that proposed project. Over the course of five different planning applications, the scheme was refined, adapted and simplified. But nature also intervened: a major flood that left most of the existing garden under water gave Herford and Lyons the idea of expanding what they had originally thought might be a small pond between buildings to create their own bespoke swimming lake, 2m at its deepest. With this lake, the pair’s original idea of creating a sensory journey into and around the two dwellings was enriched: now there could be stepping stones across the lake and the opportunity to swim, both around and under the houses (and the decking becomes diving board). It also provided the excuse for putting the houses on stilts, to bring them up to the level of the main house’s ground floor. But there are many other little thrills besides, watery and otherwise. The journey from the main house — one half of a divided, supposedly Lutyens-designed manor house (Herford suggests Lutyens’ involvement was little more than providing a sketch ‘on the back of a napkin’) — is via an enclosed, sheer glass bridge, which takes you over a brick trench dug between the houses and the new additions. Arriving in the first, larger structure, which serves as the den or playroom, black timber flooring gives on to the glazed windows, which slide back along their steel tracks to create an open deck and the aforementioned diving board. Herford says that by calling these two dwellings ‘pool houses’, they avoided the need for safety barriers, which would have ruined that big reveal. The overhanging timber eaves, lined in iroko with slender, black, steel fins disappearing into the frame, provide both protection from rain and a canopy off which rainwater pours to surround the house with slim waterfalls during a downpour. On a bright day, the eaves serve as a canvas for reflected sunlight. A broad platform of solid iroko decking connecting the two dwellings is designed to be used for open-air dining, accessed by sliding doors on both sides, while a generous decked walkway with high, wooden-topped balustrade along the further house brings you under the canopy of the tree ferns, around the side of the building, down to the garden and back via the eponymous stepping stones and up a set of cantilevered steps. The reason why costs were so much higher than their original £800,000 proposal are complex, but clearly their client was understanding and had an accommodating bank balance. The £2m final cost includes the demolition of a ‘horrible’ annexe and a couple of other outbuildings, the complete relandscaping of the gardens, and the construction of a small roof extension on the first floor of the main house to accommodate a couple of extra bedrooms that couldn’t be squeezed into the extension. The huge sheets of low-iron glass, which allowed for no margin of error, required the utmost precision, too. These were made by Cantifix. Says Herford: ‘That also entailed huge amounts of drawings that couldn’t be done until they had been signed up for the job.’ The timber glulams, which came from Germany, also had zero tolerance for deviation: ‘It all had to fit together very precisely.’ Luckily it did, which was in part thanks to ‘a brilliant foreman… who was just obsessed by millimetres’; a traditional contract as well as a family firm of contractors that helped control both quality and costs. The upside of this design was that most of the components were manufactured off-site, thereby speeding up construction time. The whole composition would, arguably, not have worked so elegantly if it weren’t for Herford and Lyons’ obsession to have all the edges line up — the glazed doors, for example, slide right back into the frame. 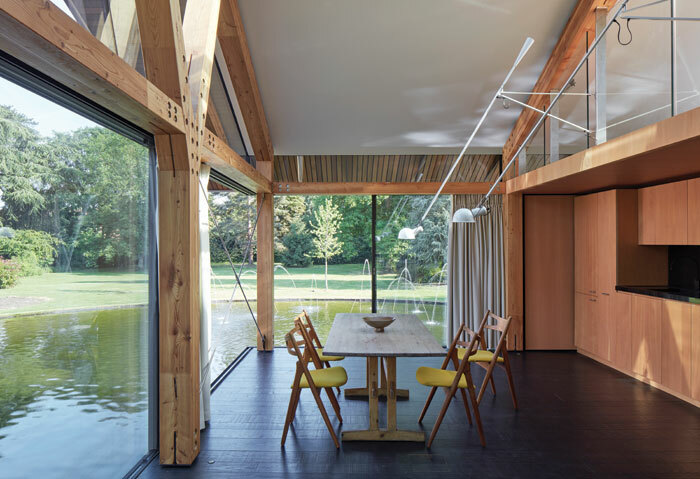 All the elements, horizontal and vertical, read as simply and cleanly as possible, including the dark floorboards of band-sawn oak, designed to blend into the blackened steel base when viewed from across the bridge or from the house, across the water. The dark floor also disappears into the water at night. ‘It’s amazing in the evening,’ says Herford. Even the underside of the structure has been carefully thought through — painted white, and lit discreetly so that in the evening the buildings appear to hover. Although one would be tempted to abandon the main brick house to move into the Stepping Stone dwelling permanently, there is no possibility of it being separated off for residential — planning permission is contingent on that not happening. For planning requirements, it is, essentially, ‘just like a conservatory’, says Herford. A residential application would have had to include triple-glazing, and less of it, says Herford, not to mention safety barriers cluttering up those divine, clear views on to the lake. The final achievement of this highly accomplished building has to be the way it transforms from an expansive pair of elegant pavilions into a modest little thing, no bigger than a double garage when viewed sideways — which is the view the neighbours get from the driveway that delivers you into a Conservation Area cluster of semi-rural cottages and modest mansions, on the edge of Hurley in Buckinghamshire. 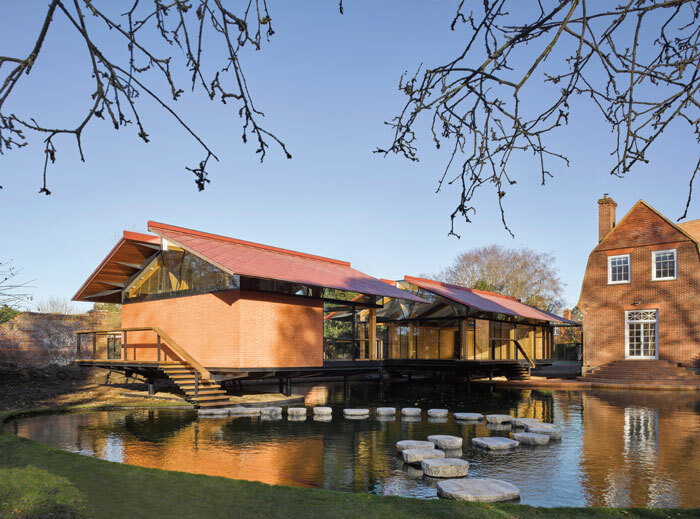 The roof floats with the slimmest of profiles over the red-brick cladding, which blends nicely with its adjoining dwelling. Herford refuses to be drawn on inspirations for the style of these pavilions, though admits to the clear Japanese, Kengo Kuma influence. As an afterthought, he adds: ‘There’s a lovely Frank Lloyd Wright detail we would have liked to add with the brickwork: he fills the verticals with mortar the same colour as the brick so it really emphasises the horizontality. It’s one thing we couldn’t do in the end. 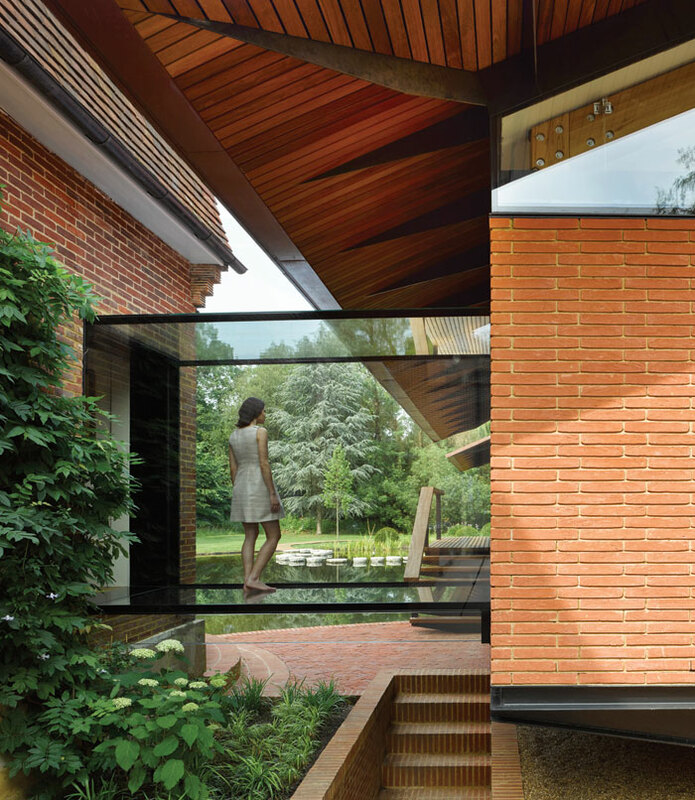 It would have been lovely: just these bands of brick…’ Maybe even the most indulgent and supportive of clients has their limits.